Vintage baseball décor is an excellent choice for your den, “man cave”, family room or even the living room of a sports-oriented household. It’s also an ideal choice for the clubhouse, sports bar or restaurant where sports fans tend to gather. From distressed pictures of baseballs to a frieze of baseball players, baseball memorabilia is an attractive way to decorate your home or place of business. Pictures of worn baseballs show your interest in the game without starting up controversy over teams. They can be displayed as paintings on canvas, as wall borders, or even as the face of a clock. Suitably distressed, paintings can appear as if they were once hung on the wall of a team dugout, inviting conversation and tales of games of yesteryears. Framed posters, photographs, and even silhouettes of players in various positions can celebrate the teams and players who have taken part in this very American game. Derived from a variety of games played with balls and bats, growing up out of neighborhood teams that met in vacant lots, baseball was the Saturday afternoon entertainment in many neighborhoods. Football fits better on television, but nothing is better for a lazy afternoon of soft drinks, popcorn, hotdogs, and roasted peanuts, than baseball. Some baseball players are so well known that you don’t have to be a fan to recognize the names. Signed baseballs, framed posters, or quotes from one of these players are bound to boost the morale of the viewer. Even if your baseball player is a three-foot tyke enrolled in the neighborhood t-ball roster, he or she will appreciate a poster displaying one of the baseball greats. It can also be an opportunity to introduce reading about and researching favorite players, getting your child ready for a lifetime of learning. Vintage baseball décor can mean a lot of things to different people. Below are some baseball décor ideas for you. 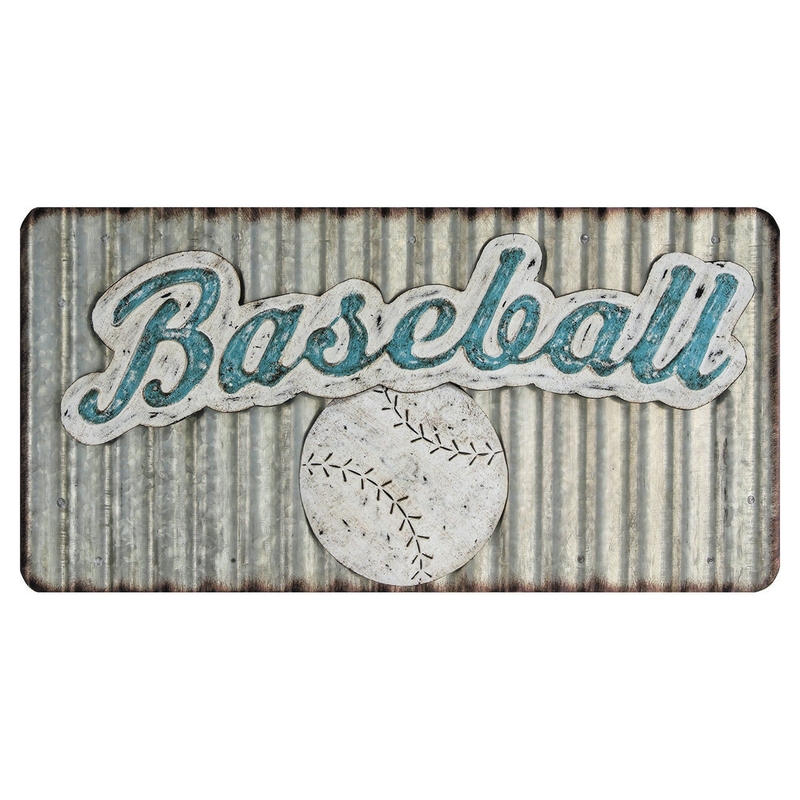 The Corrugated Metal Baseball wall décor is great for any party room or gathering place. Know with confidence that this can withstand the game with its aged look that almost makes it look like it came from a bar. The metal sheeting works well on any wood tone and active décor environment with the energy that it emits. This bright painting has a lot of texture and can add life to any room. The large baseball on it gives this piece a playful feeling and the highly textured background can add interest to your textured white walls. With an aged look, you also bring a sense of composure to your office or house. This aged canvas has the well-known baseball slide on it. The background is solid beige allowing this piece to work well with any light background. It’s large enough to be a décor centerpiece in any modern room and can bridge different tones and styles in a room. In an office, this creates a calming atmosphere with a hint of anticipation. Perfect for the baseball lover in your house, this lamp has a cover with the classic Topps Baseball Gum logo on it. With its outfield green background, batter and logo in a classical set-up this will work well in any bright room, exuding a bright and cheerful atmosphere. Everyone that knows about baseball knows at least two names of players; Babe Ruth and Lou Gehrig, who were both famous batters and record setters. This framed poster shows the famous pair on the diamond in uniforms that say “Bustin Babes, and Larrupin Lou’s”. Bring together legends at your next get together with this poster. This highly distressed wall clock will stand out in any aged baseball themed collection. Painted onto plywood this clock can work well with any light wood tone or cabinet. The metal frame though allows you to extend this piece into modern rooms of light shades and brings a well-aged hint to the environment. With the design build of a baseball, this canvas is unique. It’s on an aged parchment with the accurate patented drawings of the baseballs that are used today. This piece works well on any bright wall or light wood tone and can bring someone’s eyes to that side of the room. This allows your other baseball décor to stand out with this attention getter. These sluggers are leaning up against a book to make sure your books don’t fall down. The classic uniforms are great for any memorabilia home or area. The wood-toned base works well with many shelves as the sluggers go over the call of their duty by keeping your books protected. The distressed look makes these pieces feel like antiques. Perfect for your sports-themed room, this border will cover the wallpaper edges nicely while bringing a sport feel to your room. It works well at the top of the wall or as a bottom border. The greens and cards make a nice blend to the ceiling or floor. The cards are of players in different baseball team positions. This Brass Baseball Bottle Opener is a great addition to your baseball parties. When the game is on you can use the ball to open your bottles for you and your friends or family. With its reflective baseball design, this piece can sit anywhere from an end table to the bar counter. The finish works well with dark wood tones.